To share your work as a printed map, poster, or PDF, you need to make a layout. A layout is a composition of one or more maps along with supporting elements, such as a title, a legend, and descriptive text. Some layouts include more than one map. For example, a layout may have a main map and an overview map to show the main map in a larger geographic context. 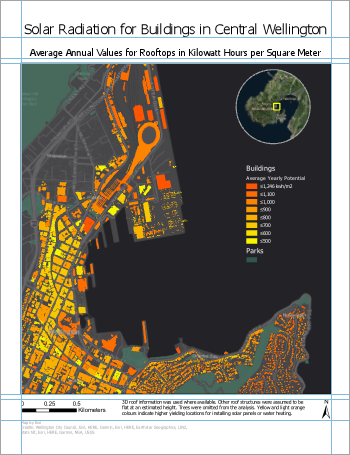 In this project, you'll make a map of average yearly solar radiation for buildings in central Wellington, New Zealand. The map is designed to help businesses and homeowners decide whether to invest in solar heating technology. At the top of the dialog box, in the Search box, type Make a layout tutorial and press Enter. In the list of search results, click Make a layout to select the project package. 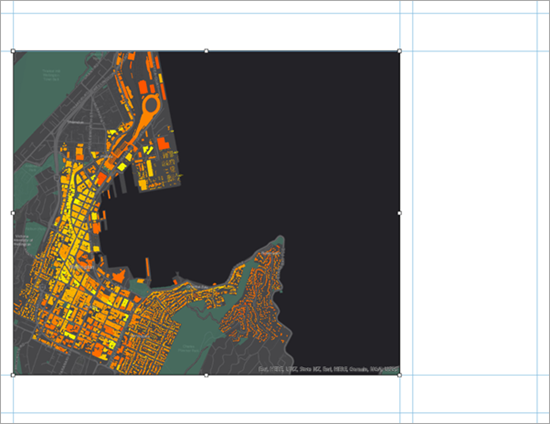 The project opens with an active map view showing buildings in central Wellington, New Zealand. This will be the main map in your layout. Buildings are symbolized by the average yearly solar radiation they get. Dark orange buildings get the most sun exposure; yellow buildings get the least. 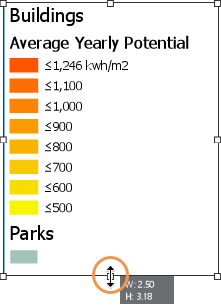 Solar radiation values are expressed in kilowatt-hours of potential electricity per square meter of rooftop. Make the Region map view active by clicking its tab, located directly above the view. 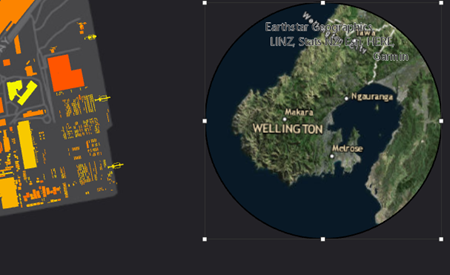 The Region map contains an imagery basemap of Wellington and the surrounding area. You'll use it later in the tutorial to add a small overview map to your layout. Click the Layout Portrait view to make it the active view. A layout based on the Central Wellington map opens. The layout includes the main map; a circular overview map; a title; and many other elements. 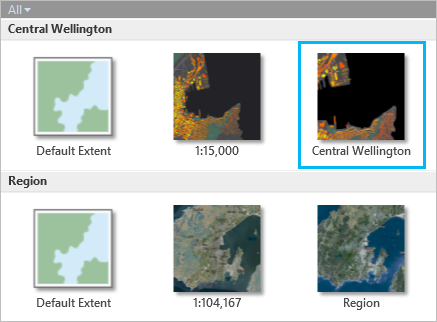 An ArcGIS Pro project can contain multiple maps and multiple layouts. You'll make a second layout, similar to this one but with a landscape orientation. 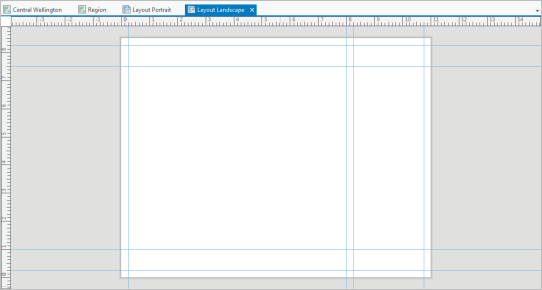 The first step in making a layout is to insert a blank layout page. On the ribbon, click the Insert tab if necessary. In the Project group, click New Layout to show page size and orientation options. Under ANSI - Landscape, click Letter. A new, blank layout view opens. In the Contents pane, under Drawing Order, right-click Layout and click Properties. On the Layout Properties dialog box, on the General tab, change the name from Layout to Layout Landscape and click OK. 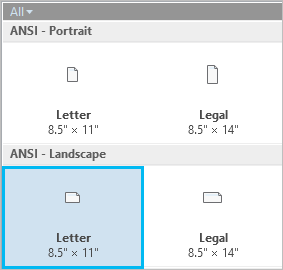 The name change is reflected in the Contents pane and on the view tab above the ruler. Right-click the top ruler and click Add Guides. Guides are nonprinting lines that help you align elements on the layout. On the Add Guides dialog box, under Orientation, click Both. Click the Placement drop-down menu and click Offset from edge. Replace the value in the Margin box with 0.25 in. Click OK. Guides are added to the layout page at one quarter-inch from each margin. Right-click the top ruler and click Add Guides again. On the Add Guides dialog box, for Orientation, click Horizontal. For Placement, click Offset from edge. Change the Margin value to 1 in. Click OK.
Right-click the top ruler again and click Add Guide. A single vertical guide is added at the position you clicked. On the ruler, place the mouse pointer at the location of the guide you just added. A blue triangle indicates that the guide is selected. Drag the guide to the 8.00 inch mark. As you drag the guide, a ScreenTip displays the decimal equivalent of the ruler marks. Right-click the top ruler once more and click Add Guide. Drag this guide to the 8.25 inch mark. To move an existing guide, drag it from its current position on the ruler. To delete a guide, right-click it and click Remove Guide. Now you'll add the Central Wellington map to the layout. On the ribbon, on the Insert tab, in the Map Frames group, click the Map Frame drop-down menu. Under Central Wellington, click the thumbnail image of the Central Wellington map. Using your mouse, draw a rectangle for the map frame on the layout. Map frames and other layout elements such as scale bars, north arrows, legends, and text can be added to the map with a single click or by drawing a rectangle. The map frame is added to the layout. It is currently selected, as indicated by selection handles. On the ribbon, the Map Frame contextual tab appears. On the layout, drag the map frame to align its left edge with the vertical guide at 0.25 inches. Click Snapping at the bottom of the layout view to toggle snapping on and off. When snapping is on, you can snap to guides as well as to other elements on the layout. See Page setup to learn more about rulers, guides, and snapping. Use the selection handles to resize the map frame. Align its top and bottom edges to the horizontal guides at 7.5 and 1 inches. Drag its right edge to the vertical guide at 8 inches. Resizing the map frame changes the scale and extent of the map, so you may want to make adjustments. To work with the map as a map—rather than as a layout element—you activate the map frame. On the ribbon, click the Layout tab. In the Map group, click Activate . The layout page turns gray. On the ribbon, the layout tools are replaced by map tools. On the ribbon, click the Map tab if necessary. In the Navigate group, confirm that the Explore tool is selected. Pan and zoom the map to an extent that you like. Use the map scale box in the lower-left corner of the layout view to set an exact map scale. You can choose a scale from the drop-down list or type a value directly in the scale box. On the ribbon, under Activated Map Frame, click the Layout tab. In the Map group, click Close Activation . You'll add a legend, north arrow, and scale bar to the layout. The legend explains the map's symbology. The north arrow and scale bar provide geographic context. On the ribbon, click the Insert tab. In the Map Surrounds group, click Legend . Draw a rectangle between the vertical guides at 8.25 and 10.75 inches. At the bottom of the legend, the Parks layer name appears next to its symbol. You'll format the legend so the name appears above the symbol instead. In the Contents pane, under Layout Landscape, expand the Legend element. Right-click Parks and click Properties . This opens the Format Legend Item pane to work with properties of specific legend entries. To work with properties of the legend as a whole, right-click the Legend heading in the Contents pane, or right-click the selected legend on the layout, and click Properties. In the Format Legend Item pane, under Show, check the Layer name box. Uncheck the Label (or layer name) box. 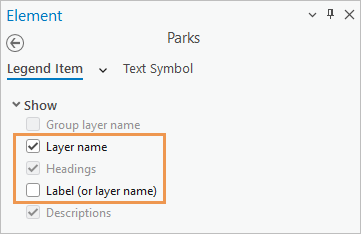 On the layout, the Parks layer name now appears above its symbol in a bold font and larger size. Close the Format Legend Item pane. On the layout, drag the legend so that its rectangle snaps to the horizontal guide at 7.5 inches. If necessary, resize the legend rectangle by dragging its bottom edge so that the rectangle fits the legend element closely. On the ribbon, click the Insert tab, if necessary. In the Map Surrounds group, click the North Arrow drop-down menu and click ArcGIS North 1 or a north arrow you like. In the lower left corner of the layout, click to place a north arrow on the layout. Drag the north arrow to the lower left corner of the layout until it snaps to the quarter-inch guides. If you accidentally resize an element when you intend to move it, click the Undo button on the Quick Access Toolbar. On the Insert tab, in the Map Surrounds group, click the Scale Bar drop-down menu. From the list of scale bars, under Metric, click Scale Line 1 Metric. At the bottom of the layout, click to place the scale bar on the layout. Snap the scale bar to the horizontal guide at 0.25 inches. Center it relative to the map frame or put it in a place that looks good to you. As you move or resize layout elements, dashed blue horizontal and vertical lines appear. These are smart guides, which help you align the selected element with other layout elements and with the layout page. If necessary, resize the scale bar so that its maximum value is 1 kilometer. Click an empty area of the layout page to deselect the scale bar. You'll add a map title and descriptive text. On the Insert tab, in the Text group, click Rectangle . On the layout, above the map frame, draw a rectangle for your map title. When you release the mouse button, the word Text appears inside an outline of the box. This is the beginning of your map title. The text is highlighted so you can start to edit it. Type the following text: Solar Radiation for Buildings in Central Wellington. When you're finished, click an empty area of the layout page. The text element is now selected on the layout. On the ribbon, under Text, click the Format tab. In the Text Symbol group, change the text symbol font size to 22 pt. Change the text symbol font style to Bold. Align the title with the vertical guide at 0.25 inches and the horizontal guide at 8.25 inches. Click an empty area of the layout page to deselect the title. Next, you'll add a short description to help readers understand the map. Click the Insert tab if necessary. In the Text group, click Rectangle . On the layout, draw a box underneath the legend. 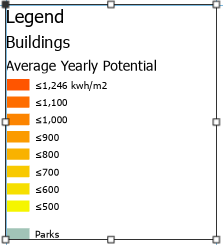 Type or copy and paste the following text into the text rectangle: Average annual solar energy potential values for rooftops in kilowatt-hours per square meter. Yellow and light-orange colours indicate higher-yielding locations for installing solar panels or water heating. Three-dimensional roof information was used where available; other roof structures were assumed to be flat at an estimated height. Trees were omitted from the analysis. Click an empty area of the layout page to select the text element. On the ribbon, under Text, click the Format tab. In the Text Symbol group, change the text symbol font size to 8 pt. Change the text color to Gray 50%. Align the left edge of the text element with the vertical guide at 8.25 inches. Align the right edge with the vertical guide at 10.75 inches. Resize the text rectangle so that it fits the paragraph closely. Click an empty area of the layout page to deselect the text. If spell-checking is enabled on the settings page (as it is by default), unrecognized words are marked with wavy underlines. For example, you may see the word colours marked as an error. See Proofing options for information on correcting spelling in a layout. These graphical marks do not appear when the map is printed or exported as a file. In addition to static text, which doesn't change, you can insert dynamic text. Dynamic text is linked to properties of the map or your computer's operating system and updates automatically when those properties change. For example, dynamic text can reflect the last time the map was saved or printed. On the ribbon, click the Insert tab if necessary. In the Text group, click the Dynamic Text drop-down menu. Under Map Frame, click Credits. Click below the map description to add the dynamic text. Align it with the vertical guide at 8.25 inches. In the text element, the words Wellington City Council are dynamic. This information is a map property of the Central Wellington map and is automatically updated on the layout if the property is changed. 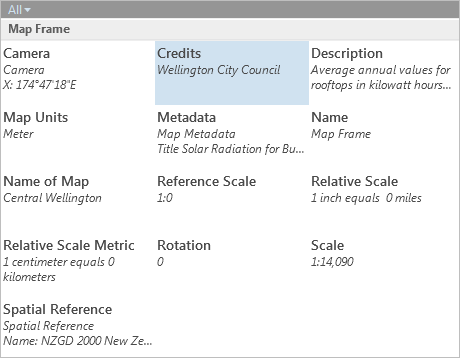 To access the credits, make the Central Wellington map view active. In the Contents pane, right-click the map name and click Properties . On the Map Properties dialog box, click the Metadata tab. In the layout view, right-click the selected dynamic text element and click Properties . In the Format Text pane, in the text box, the dynamic text is displayed as a tag. Other text in the box is static text that can be edited. To see how dynamic text is formatted, hover the mouse pointer over the tag or click the Text View button . 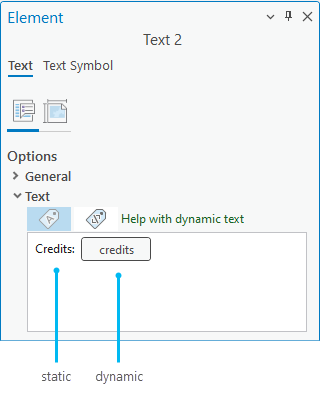 In the text box, click in front of the word Credits (the static text, not the tag). Type Map authored by: and then type your name. Press Enter to make a line break. At the top of the Format Text pane, click the Text Symbol tab. Under the Text Symbol tab, click the Properties tab and make sure the General tab is selected under it. Expand Appearance. Change the Size to 8 pt and the Color to Gray 50%. Click Apply. You could have made the same changes using the contextual Format tab on the ribbon. Close the Format Text pane. If necessary, resize the dynamic text element on the layout so that the second line is visible. The dynamic text element reflects your edits. 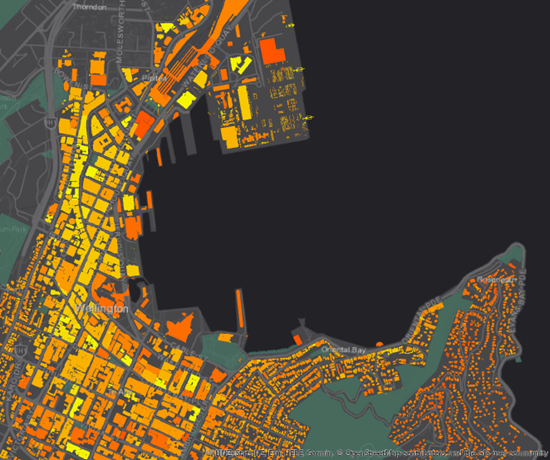 To show central Wellington in a larger geographic context, you'll create an overview map. On the Insert tab, in the Map Frames group, click the Map Frame drop-down menu. Under Region, click the thumbnail image of the Region map. Draw a rectangle for the map frame on the layout. It doesn't matter where you draw it—on top of the existing map frame is fine—or how big you make it. The map frame is added to the layout. In the Contents pane, there are now two map frames: Map Frame and Map Frame 1. It will be easier to tell them apart if you rename them. In the Contents pane, with Map Frame 1 selected, click the name Map Frame 1 to make it editable. Type Overview Map and press Enter. In the Contents pane, click Map Frame to select it and click again to make its name editable. Type Main Map and press Enter. When you rename the items, they may expand in the Contents pane. Optionally, in the Contents pane, collapse the Overview Map and Main Map items. Now you'll reshape the overview map. In the Contents pane, click Overview Map to select it. On the Insert tab, in the Map Frames group, click the Reshape drop-down arrow and click Circle . 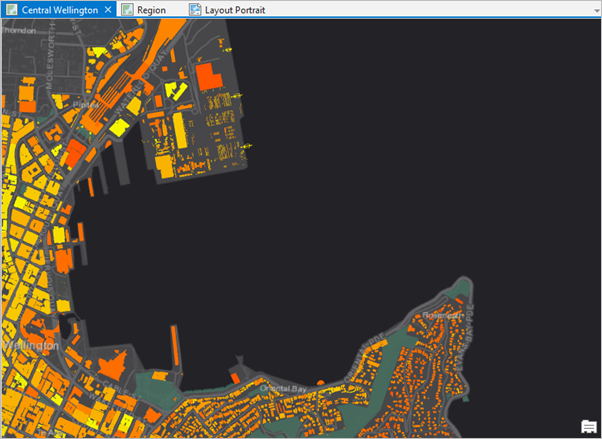 Place the mouse pointer over the city of Wellington in the Region map frame. Drag to draw a circle and then release the mouse button. Depending on the size of your map frame, your map may look different. The overview map frame is reshaped to a circle. Drag the Overview Map map frame to the upper right corner of the Main Map map frame. Use the selection handles to resize the overview map so it looks good to you. 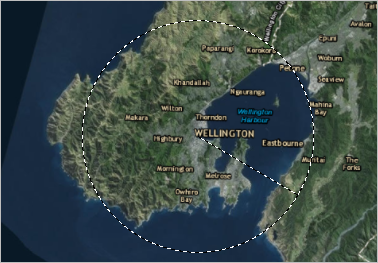 The map shows Wellington in a larger context, but doesn't indicate the specific area covered by the main map. You'll add an extent rectangle to show this. On the Insert tab, in the Map Frames group, click the Extent Indicator drop-down menu and click Main Map. A small black rectangle representing the extent of the main map is drawn on the overview map. The extent rectangle is hard to see on the dark basemap. On the ribbon, under Map Frame, click the Format tab. In the Symbol group, change the Line color to a bright yellow, such as Solar Yellow. Change the width to 2 pt. Now that the extent indicator is easy to see, you'll adjust the scale and extent of the overview map. On the ribbon, click the Layout tab. In the Map group, click Activate . Zoom or pan the overview map to an extent you like. You'll give the overview map a lighter border to set it off from the surrounding black space. On the ribbon, under Map Frame, click the Format tab. In the Current Selection group, click the drop-down menu and click Border. In the Border group, change the Line color to Gray 50%. Finally, you'll adjust the alignment of the elements in your layout. Hold the Shift key. On the layout, select the legend and the two blocks of text. All three elements appear with selection handles. Right-click any of the selected elements and click Align > Distribute Vertically. The vertical spacing between the elements is equalized. The effect will be best if the legend and text rectangles don't include empty space at the bottom. You may want to resize these elements and try again. Click an empty area of the layout page to deselect the elements. Now that your layout is finished, you can print it or export it to a file that can be easily shared. This section provides the steps for exporting the layout as a JPEG file. On the ribbon, click the Share tab. In the Export group, click Layout . The default file name is Layout Landscape (the name of your layout). If necessary, click the Save as type drop-down menu and click JPEG (*.jpg). On the Export Layout dialog box, accept the default output location or browse to the location where you want to save the file. The layout is exported as a JPEG file. You can open it from Windows Explorer to see how it looks. If you want to print your layout, click the Layout button in the Print group. You may need to change some printer settings, such as the page orientation, before you send the layout to the printer. In this tutorial, you used several different layout elements. There are others, such as tables, charts, and grids and graticules, to try on your own. Each element you insert into your layout has its own design and formatting options. 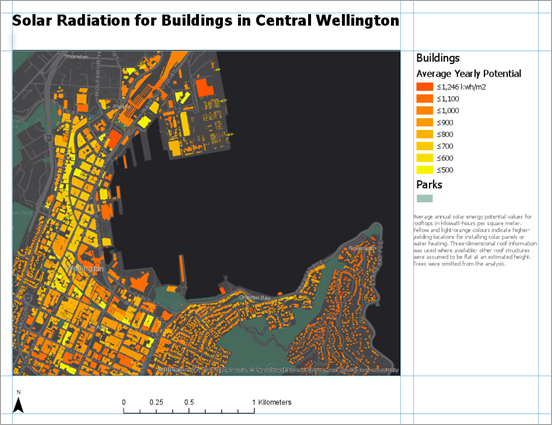 This layout served a specific purpose—to show the solar energy potential for buildings in downtown Wellington. A layout may also have a broader purpose. It can be used as a template to generate a map series: a collection of maps with a consistent design that represent different parts of a large geographic area, such as the regions of New Zealand. Learn more about how to create a map series.